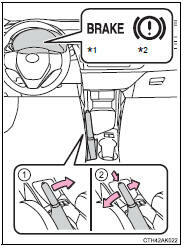 1 To set the parking brake, fully pull the parking brake lever while depressing the brake pedal. 2 To release the parking brake, slightly raise the lever and lower it completely while pressing the button. A buzzer will sound if the vehicle is driven at a speed of approximately 3 mph (5 km/h) or more with the parking brake engaged.